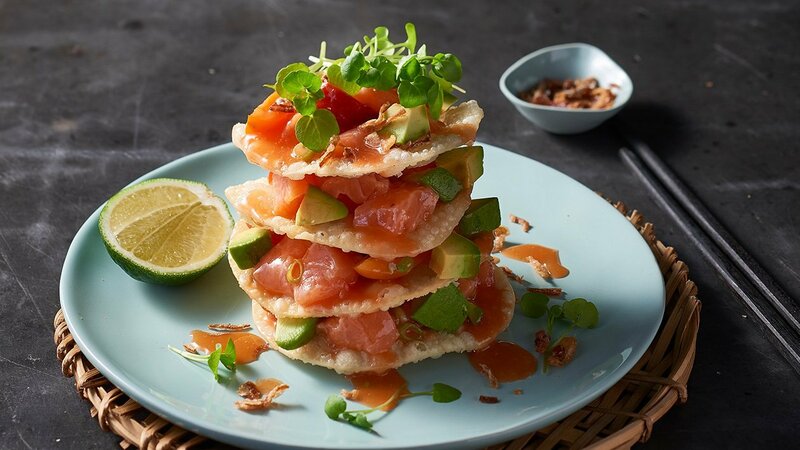 This ceviche style salmon with the addition of KNORR Sweet and Sour Sauce gives this classic method and Asian twist. The wonton wrappers add a great texture which is sure to excite your diners. Combine KNORR Lime Powder and 150ml water and whisk to combine. Add sauce to salmon and avocado. Deep Fry until golden and crispy. Layer 1 wonton wrapper on serving plate, top with filling and sauce. Repeat using 3 more wrappers and filling and sauce. Top with extra micro herbs and fried eschallot. Serve with extra sauce and lime wedges.